Draughtsmen sometimes had to fit the area they were mapping on to an irregular shaped sheet of paper by changing its orientation. This is why this plan is not oriented northwards and Dunterton appears to the far right of Callington rather than above it. The Meridian of Kitt Hill is marked along the base of the drawing with Kit Hill Beacon as the centre point. Relief is indicated by grey brushwork and trigonometrical altitudes marked in red. 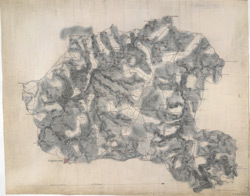 The accuracy with which the Ordnance Survey drawings indicate relief set them apart from the earlier county maps and qualified them for military use.